Labor Day weekend is almost over so its time to start decorating your home before Halloween. Here is more simple handmade decorating ideas I found on internet and gather together. 1. Spider-web. 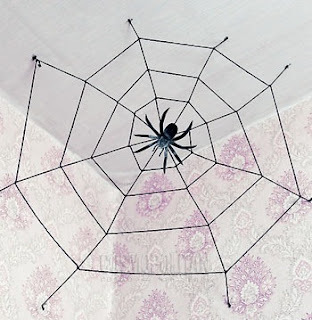 Materials: spider (it can be toy - you don't need a real one); rung ladder; black yarn, push pins (black). Take a yarn and knot it on the end. Pin it to the ceiling. Imagine you are spider and decide how, where and how big your web will be. Measure thread to the wall, cut, knot, pin the knot to the wall. Do totally the same with all radiating threads and make up a bundle from them in center. After putting together all radiating threads attach spiral thread, putting an knob on each intersection. pin. Using this pin attach spider to the web. 2. Bats. 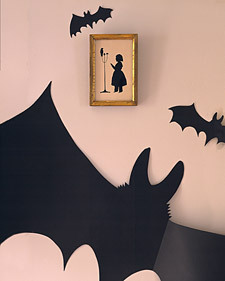 For your home bats you need black paper or cartoon, scissors and this template. Download template, print it in different sizes and put bats all around the home. 3. For bathroom. Buy the cheapest curtain you can find and red paints. Cut this curtain and put red paint on it, you can smear, sprinkle, put hand prints - anything you want. The curtain should looks really carelessly. Replace your regular light bulb with red light bulb. Now you have terrifying bathroom. I can't wait to decorate my apartments in beaverton on Halloween! Your ideas are just too cool.